Organic Thin Film Deposition by Laser Ablation? 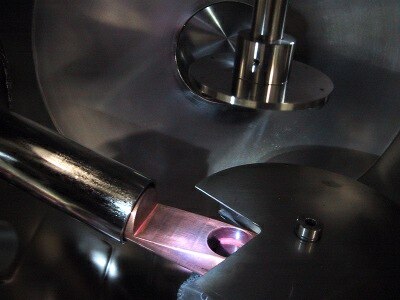 Laser ablation of organic materials is challenging. 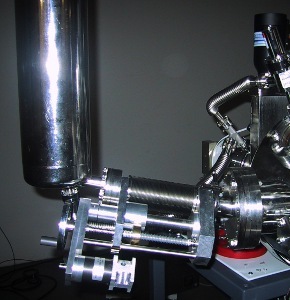 A conventional PLD (pulsed laser deposition) approach is often not feasible, because complex organic molecules tend to be damaged by the ablation process and the UV light involved. 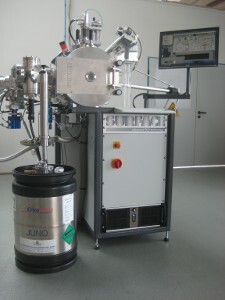 On the other hand, a deposition technique is desireable that allows the study of thin film interfaces of organic/inorganic substances or superlattices thereof. 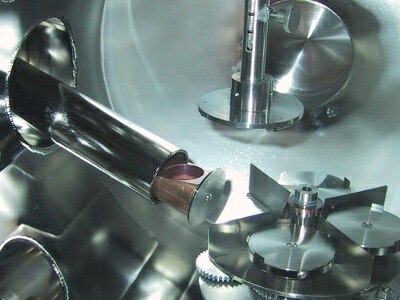 MAPLE (matrix-assisted pulsed laser evaporation) can be a solution for this problem. Instead of directly ablating the desired organic compound, for MAPLE the material is mixed with a suitable – that means volatile and UV-absorbing – solvent and then frozen. The frozen solution is then used as a target in a PLD-like setup. The incident laser pulses heat up the solvent, which evaporates and entrains the organic compound to be deposited. 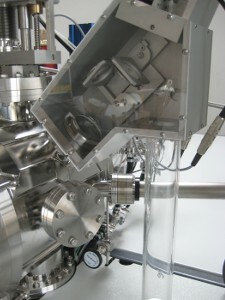 A plume of material forms, and the organic compound can be deposited onto a substrate, whereas the volatile solvent can be pumped away by the vacuum pump. 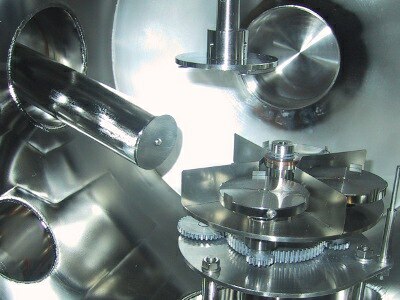 Compared to conventional deposition techniques like spin coating, MAPLE offers advantages like better film thickness and morphology control. 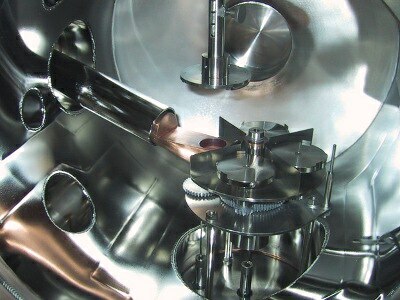 At the same time, the deposition can be combined with conventional PLD of inorganic materials. This opens a path to study interfaces and superlattices between these materials! This clear programmable preparation proceess avoids cumbersome pre-freezing of targets and ensures clean and moisture-free conditions. 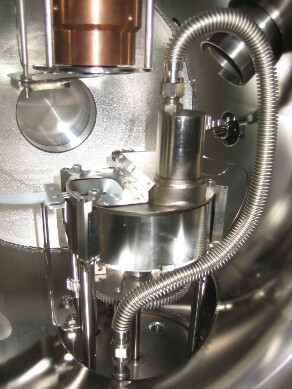 The cooling of the targets is controlled via a special LN2 control valve and an integrated vacuum isolated supply line into the chamber. The temperature of the manipulator is measured with multiple PT100 sensors and allows accurate control of the LN2 flow at low consumption. 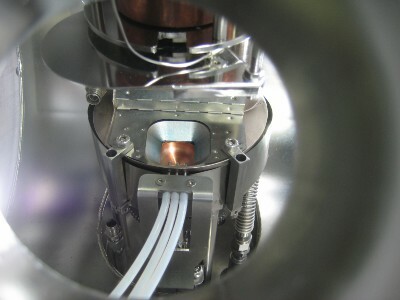 The target manipulator reaches -195°C and stays constant at this level even when the substrate is heated to 700°C during oxide deposition. The 2D laser scanner has an automated scan speed adaption depending on the actual repitition rate of the laser. 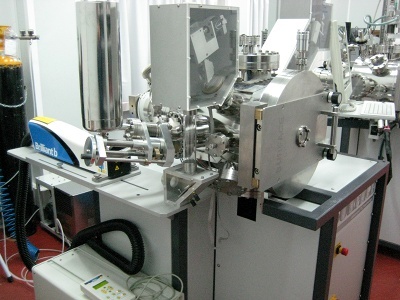 As a standard 10Hz laser systems like Excimer or NIR lasers are used. All six targets of the manipulators are part of an individual fluence control process. 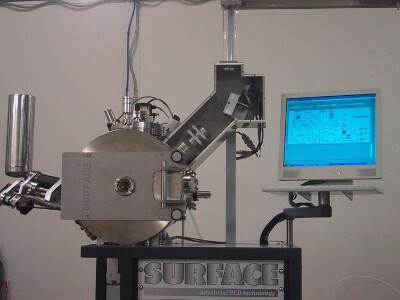 The dedicated fluence defined in the process recipe of each deposition step is measured directly on the target and calibrated at the beginning of each deposition step by adjusting the actual target energy corresponding to the actual laser spot size to obtain the final target fluence. This is done with an accuracy better than +/-2% - more details about this can be found in the automated fuence control page. Copper crucible for MAPLE targets inside liquid nitrogen holder. 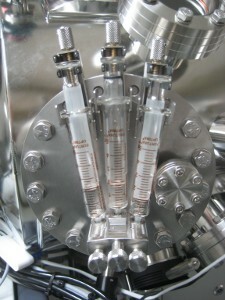 The three filling tubes are also visible.